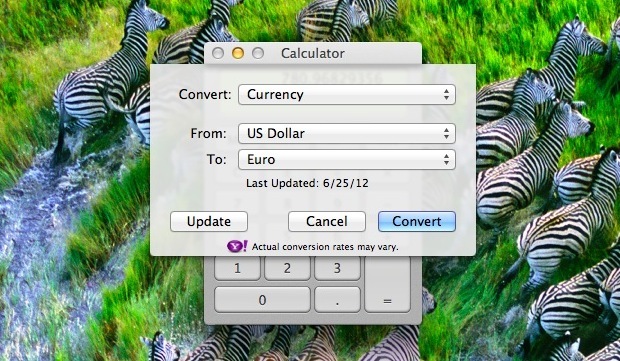 The conversion rates are pulled from Yahoo, but it’s always a good idea to hit the “Update” button so you can be sure to get the most recent exchange rates. This is a really handy feature if you’re participating in international commerce or even just traveling. 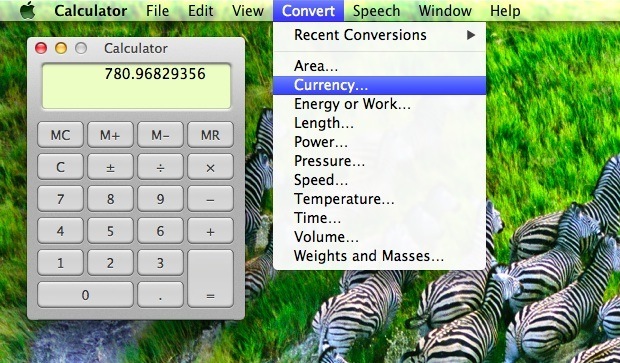 A similar feature is also available in Dashboard with the Unit Converter widget. Where can I get the desktop background of the zebras? It looks beautiful! It’s from the latest version of Mountain Lion Dev Preview, it should be included in the final version of 10.8 too. Found the retina Zebra wallpaper from MacBook Pro at WWDC! In a full 3200×2000 pixels nothing less! nice tip…however the list of currency looks severely limited, is there any way of adding to the list? I just use google to convert currency.